According to general relativity, the structure of space-time depends on the amount of material that is present close by. In other words the coordinate axes are not straight as we are used to. The larger amount of material that is present, the larger the distortion of space-time becomes. If the amount of matter in a given place is very large the curvature of space will be so large that a straight line is bent back to the same point. This means that light will also be bent back since it follows straight lines. Therefore no light can escape from such an object, and it appears as non-luminous to an outside observer. This is what one calls a black hole. 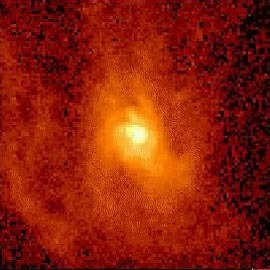 In the centre of a galaxy large amounts of matter can be gathered and one believes that there are black holes in the centre of some galaxies. One example of such a galaxy, where observations suggest that there is a black hole in the centre is NGC4261. 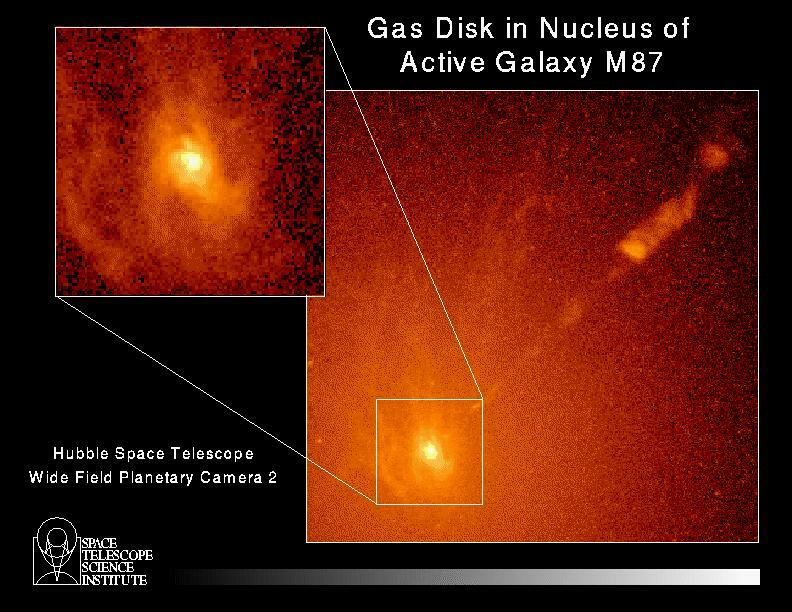 Another type of galaxies which may contain black holes in the centre are those with active galactic nuclei. One example of a galaxy where one has made observations indicating this is M87. A photograph from the Hubble space telescope showing the nucleus of the galaxy NGC4261. The whiter parts have a density that is similar to a normal galactic nucleus, whereas the browner areas have much higher density and probably there is a black hole in the middle. A picture from the Hubble space telescope of the galaxy M87. One sees a spiral disc with hot gas being pulled into the centre. One estimates that the central part is about the same size as our solar system, but it weighs about 3 billion times more. This means that the conditions for a black hole are fulfilled.